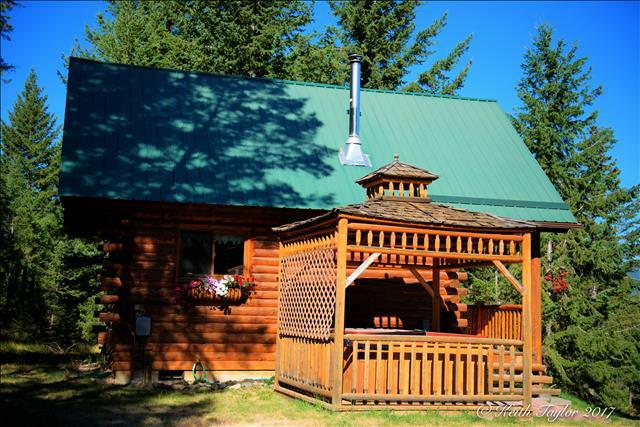 Our vacation rental cabin, The Montana Cabin, is a privately owned, 880 square foot, two-story log vacation home that has 1 downstairs bedroom (queen bed), a large sleeping loft (King bed and two fold down full-size futons), and 1 bathroom. Built in 1998, it sleeps a maximum of eight and has its own private gazebo and hot tub. NOTE: The Montana Cabin now has Air Conditioning for your comfort during the warmer summer season! 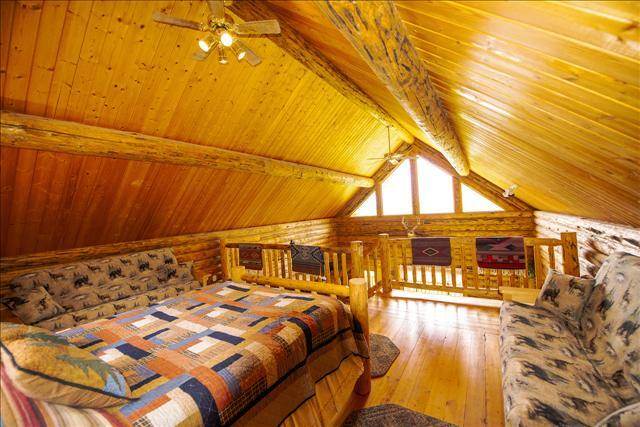 Your home away from home lends itself to a relaxing, fun vacation in the Tobacco Valley area. Rexford and Eureka are small towns situated around an hour from Whitefish and Kalispell Montana. 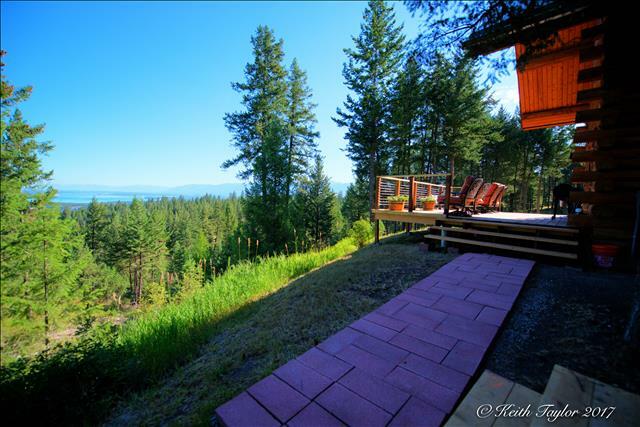 Even better, you're just minutes away from the beach area of beautiful Lake Koocanusa. 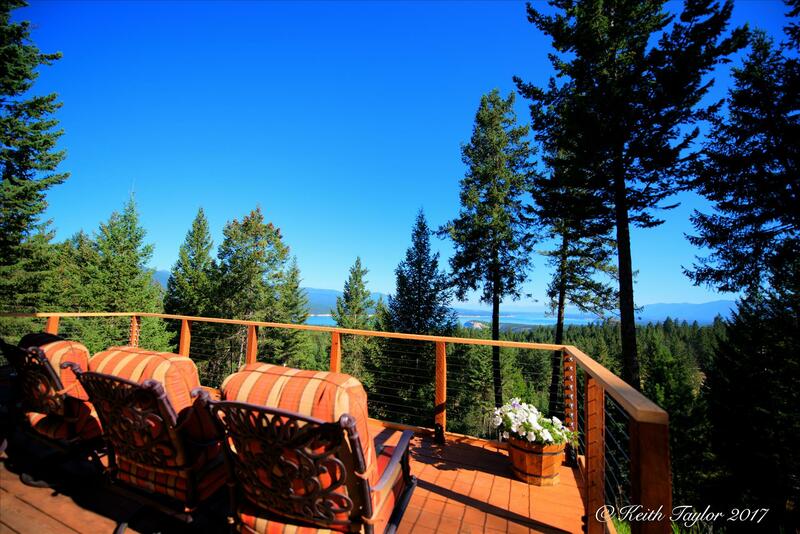 Overlooking Lake Koocanusa, Canadian Rockies, and the surrounding picturesque Tobacco Valley is an area in northwest Montana that welcomes visitors. 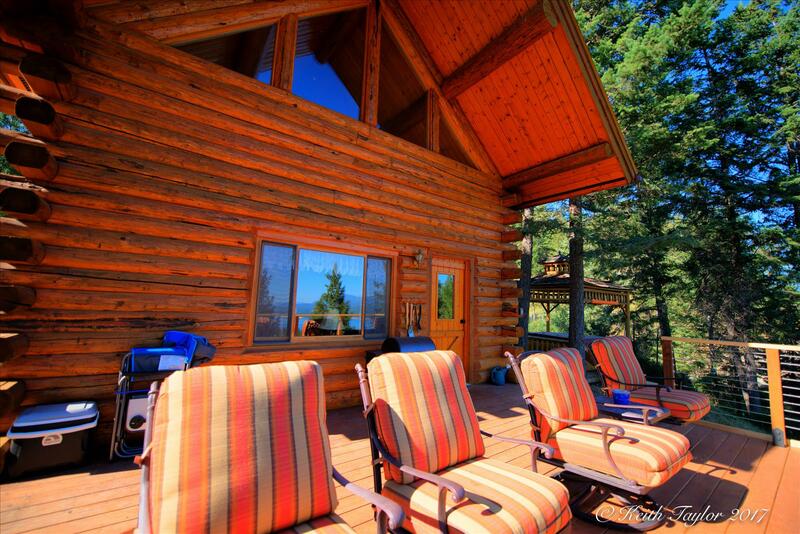 If you're looking for peace, serenity, and solitude you will find it at The Montana Cabin. The sights are spectacular. With blue skies and surrounded by huge forests, the Tobacco Valley and Glacier Park area is a wonderful place to take a relaxing vacation. 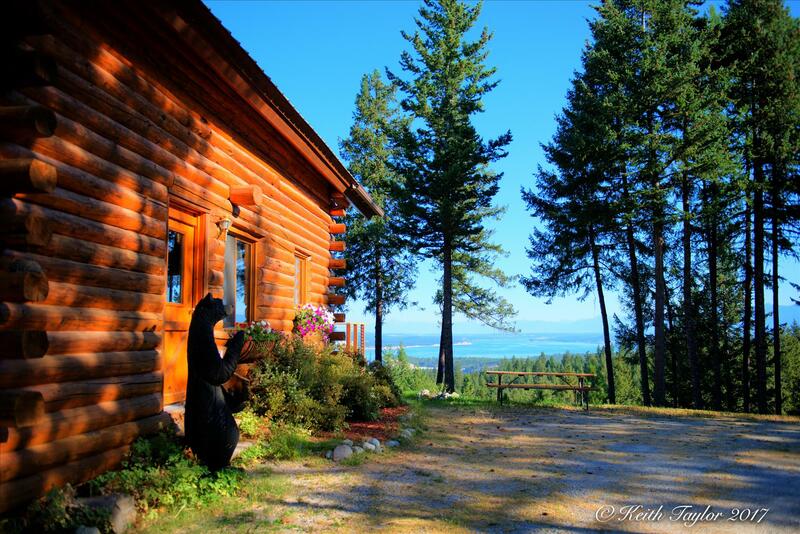 We hope you join us for memories of family, friends, beautiful forests, wildlife, and our charming vacation home away from home - The Montana Cabin. Our stay at The Montana Cabin was absolutely wonderful! The amazing views, the hot tub and this combination made us feel totally relaxed. 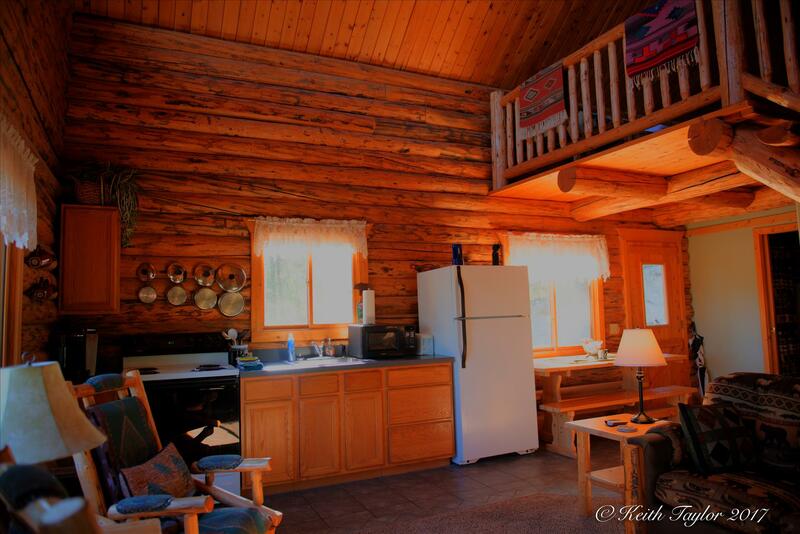 The cabin is clean, well equipped, comfortable, ... it feels l...read more. We really enjoyed our stay at The Montana Cabin. 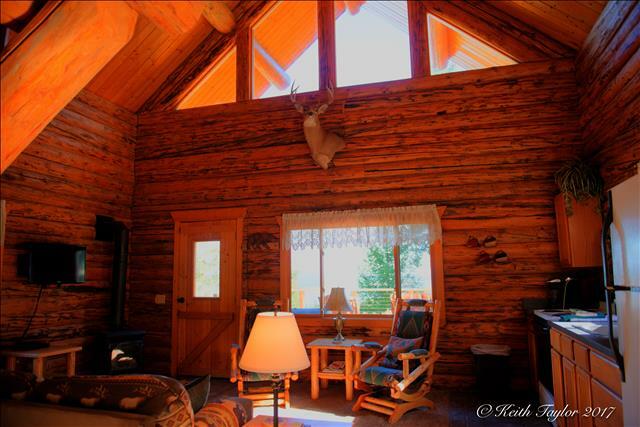 The cabin and it's setting is just what you would expect to find in Montana especially for people like us who had never been to Montana before. We sp...read more. 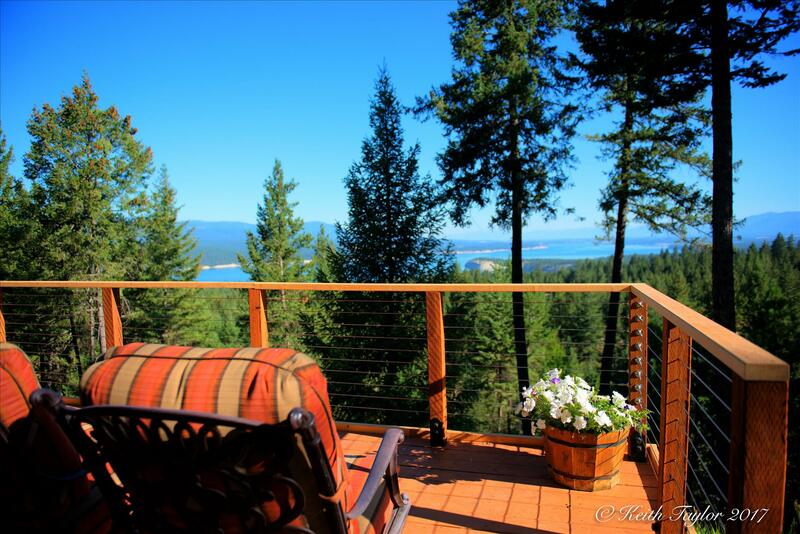 The view was awesome from the Montana Cabin! 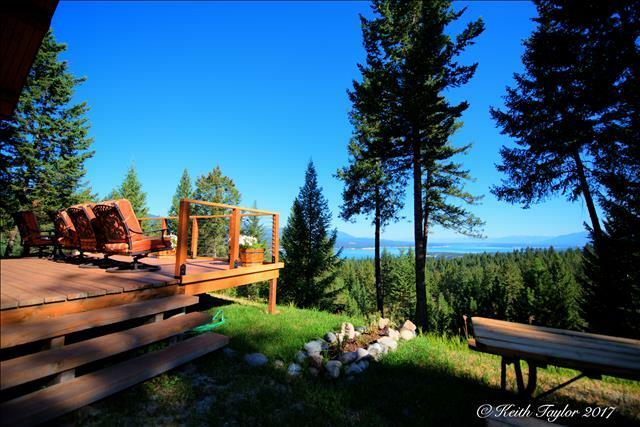 Our family loved the Montana Cabin, we spent every morning enjoying our coffee and the view from the hot tub or the deck before spending the day on the lake. In the evenings after we got off the lake ...read more. We truly enjoyed our week at the Montana Cabin. The view is unbelievable and the peace and quiet of every day life is quite therapeutic. The kids took over the loft as the "Kid Zone" and loved to ...read more. The cabin and views were more than we could of ever expected. 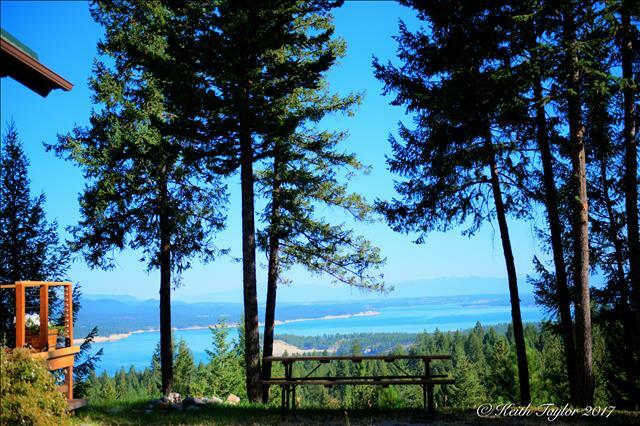 Donna was so kind in meeting us upon arrival and offering is great tips on the best trails to hike and was so kind to allow us to borrow h...read more. We had a delightful week at The Montana Cabin, finding it quiet, peaceful and very relaxing. This was our third visit and surely not our last. Each visit we have found new areas to explore including...read more. In all we had a great time at the Montana Cabin! It's was perfect. Better than expected. The Montana Cabin experience was incredible. We loved the rustic log cabin feel, nicely situated among the quiet wooded surroundings on a hill. 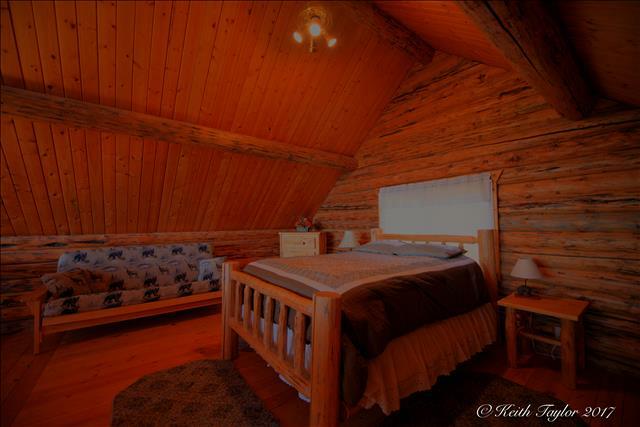 There is a bedroom on the main floor, but we all decid...read more. 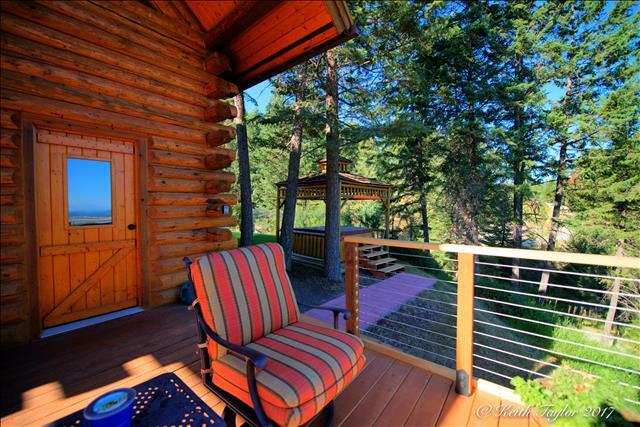 Our stay at the Montana cabin was wonderful, it looks just like the pictures. Wild life all over and had a deer eating grass from the yard when we arrived at the cabin. Will come back again! Your...read more. 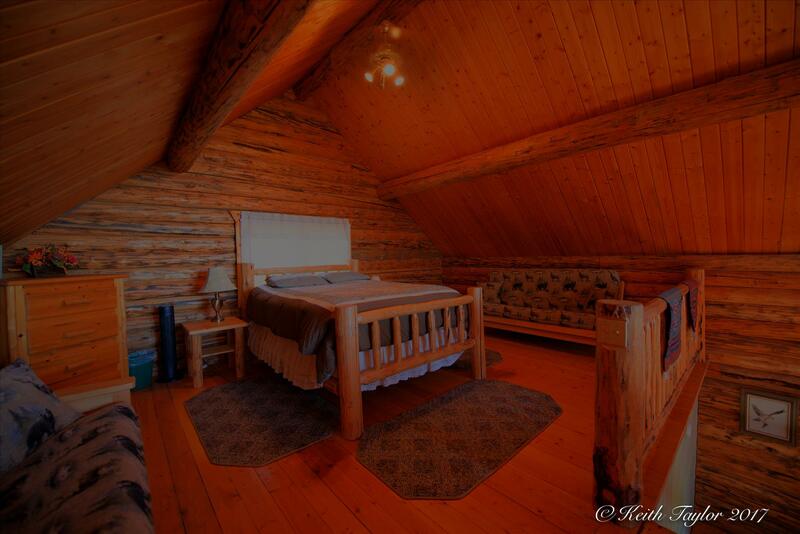 The Montana Cabin is a perfect Montana Amish log cabin for your vacation. From the time you enter this cabin you'll see quality. There's an open living room area with vaulted ceiling is a perfect area to share all of your stories; not to mention a the large deck or picnic table seating area. The highlight of The Montana Cabin is the large loft sleeping area with a very comfortable King bed which overlooks Lake Koocanusa. For larger groups, there are also two comfortable, full-size, futons in the loft area. The downstairs bedroom has a queen-size bed. In the kitchen, you'll find everything you need for a perfect meal with full-size appliances (stove, refrigerator, microwave, Keurig coffee maker). 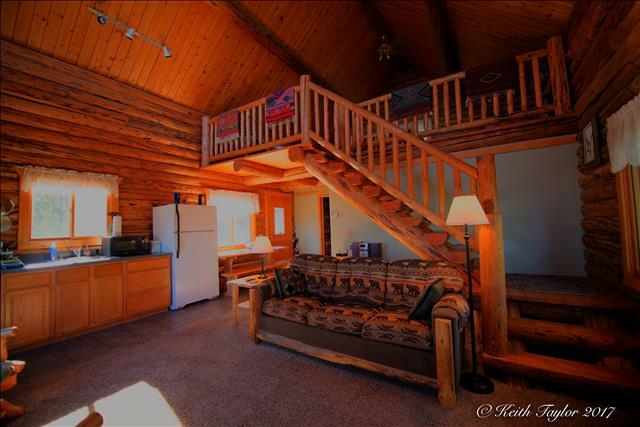 There's also a washer/dryer at The Montana Cabin. This is a non-smoking home and pet-friendly (upon request). 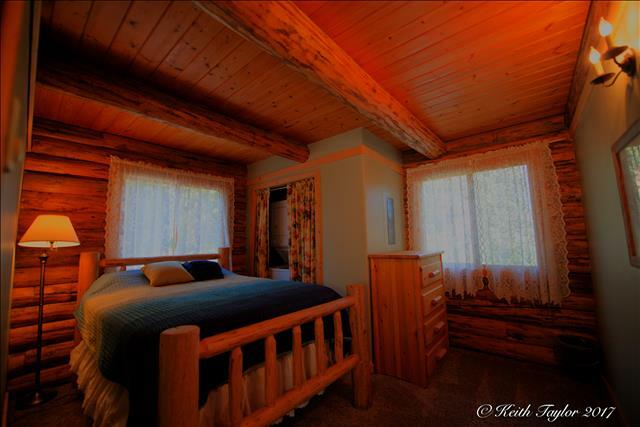 To keep our cabin beautiful for your enjoyment and the enjoyment of future guests, a cabin set-up and cleaning fee of $100.00 is charged per reservation. All reservations require a $300 damage deposit that will be charged to your credit card when your initial reservation is placed and is refundable after check-out and inspection of your cabin. 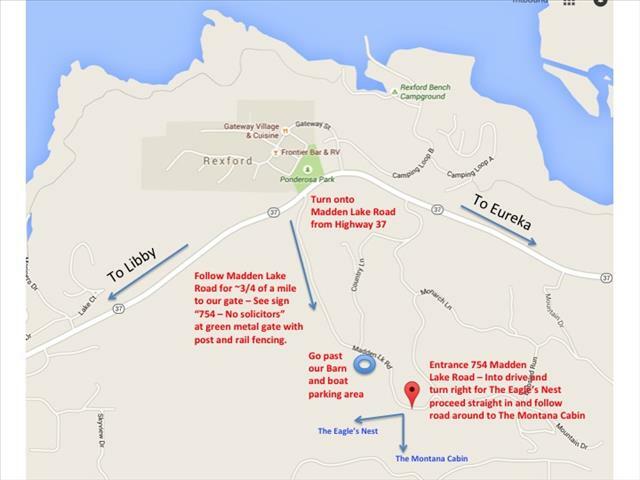 From Highway 37 turn onto Madden Lake Road turn near the entrance to Rexford. Once on Madden Lake Road follow road up past the water tower, past our barn, until you reach a post and rail fenced entrance with a sign "754" - this is our driveway. Continue following the driveway entrance road straight ahead, up and following around to the left and you'll come to The Montana Cabin.